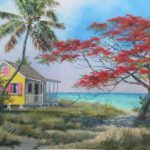 Born in 1940 in northern Michigan, Phil Capen developed an interest in art early in life, learning the basics from his father. After graduating with a B. 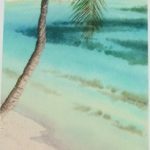 A. degree in Chemistry from Eastern College in St. Davids, Pennsylvania, Capen’s artistic talents lay dormant while he pursued a career in industrial chemistry in Pennsylvania and Michigan. 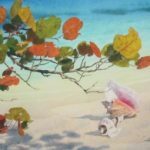 In 1969, after earning his teaching credentials, Capen and his wife, Rosemary, moved their three young children to St. Croix in the U.S. Virgin Islands. There he began a new career, teaching chemistry at St. Croix Senior High School. 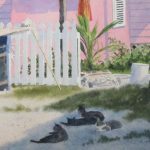 After living in the tropics a short time Capen’s artistic talent revived with a year of study under Charles Hawes (AWS) at The College of the Virgin Islands. 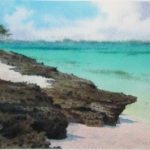 During his three year stay in the islands, Capen laid a solid foundation for his future art career by painting numerous watercolors of the local landscape including scenes of beaches, boats, houses, and underwater coral reefs. 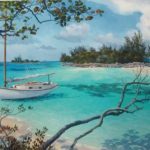 Capen’s excellent work has achieved a growing popularity among the general public and is regularly recognized by awards from the art community. 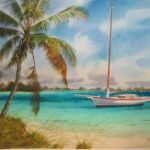 Thousands of private collectors treasure their Phil Capen art, and many corporations, including Disney and Burger King, have added Capen originals to their collections. 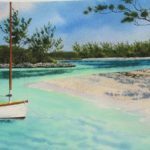 On three different occasions Capen’s work has been included in the catalog of the “top one-hundred” paintings of the “Art for the Parks” annual contest sponsored by the U.S. National Parks. 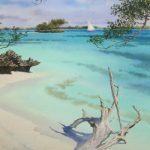 Another piece, “Windward Shore”, was recently featured in the book, A Gallery of Marine Art, published by Rockport Publishers. 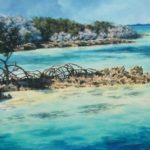 He is an exhibiting member of the American Artists Professional League, Inc., and the International Society of Marine Painters. 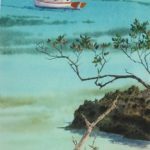 In the early 1980’s, because of the overwhelming demand for Capen’s work, he began publishing his art as limited edition prints. Over 70 images have been reproduced in editions of 750 to 1750; many of which have completely sold out. Until 1998 these prints were available only as offset lithographs, but with the coming of new technology all of Capen’s reproductions for the foreseeable future will be reproduced with even greater fidelity as giclees (high quality computer generated digital art prints). 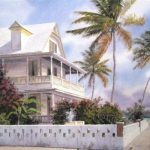 Capen’s Giclees along with his offset prints are available from hundreds of fine art and framing galleries in Florida and the Caribbean.